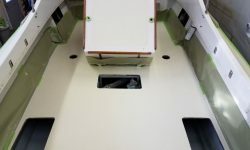 Starting with the cockpit, I applied the second, textured coat of the KiwiGrip paint. 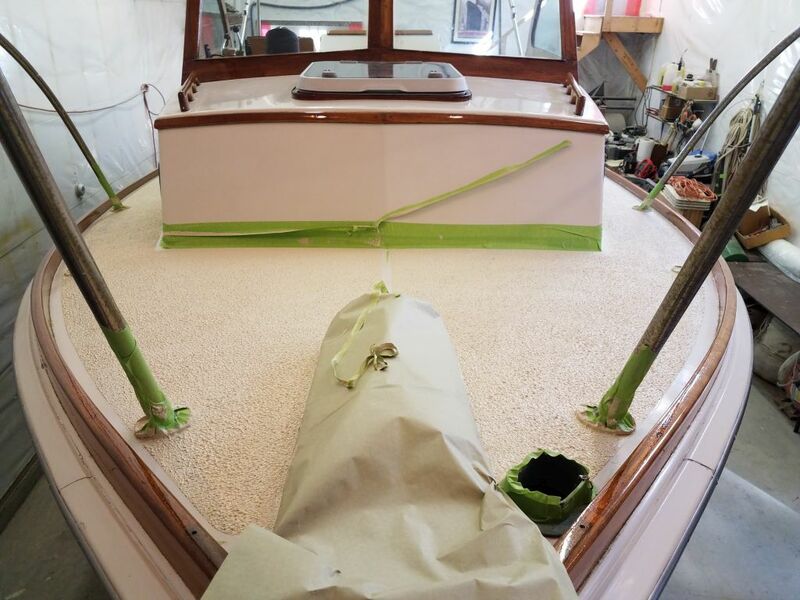 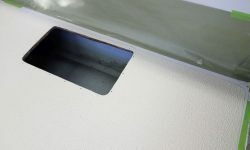 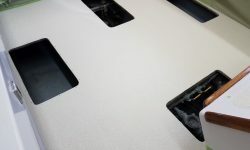 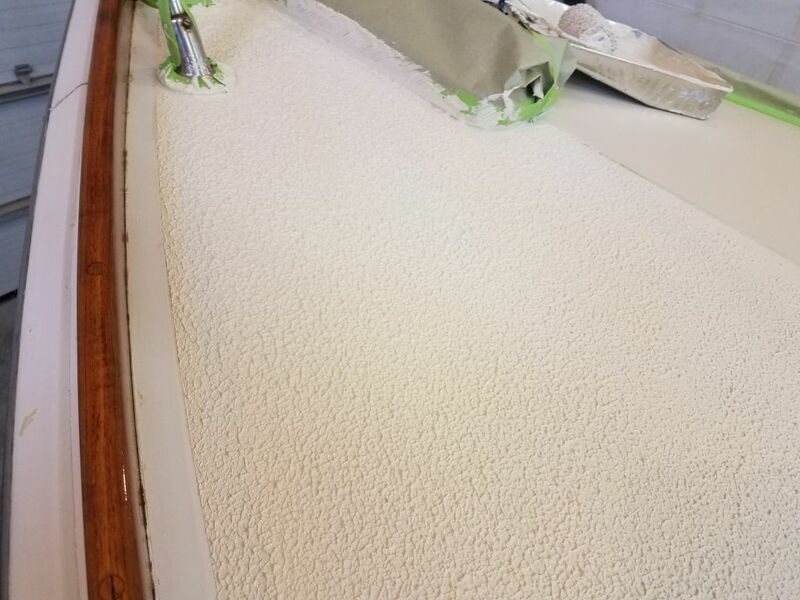 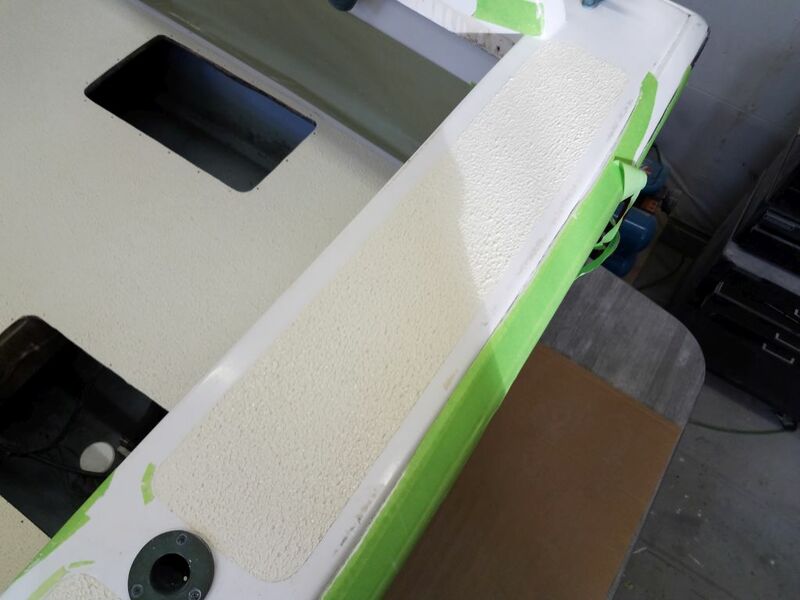 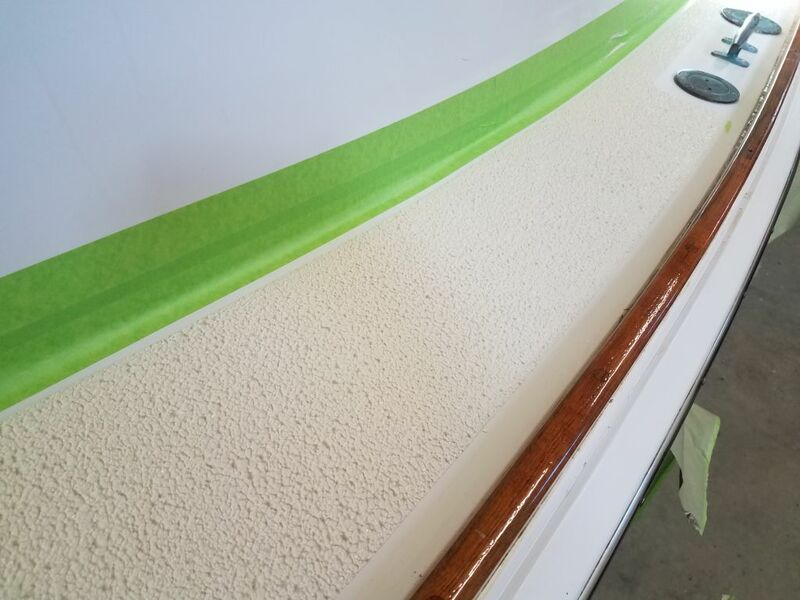 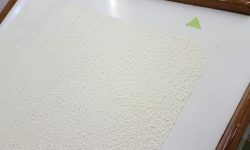 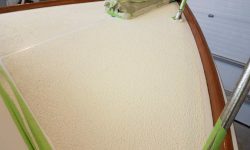 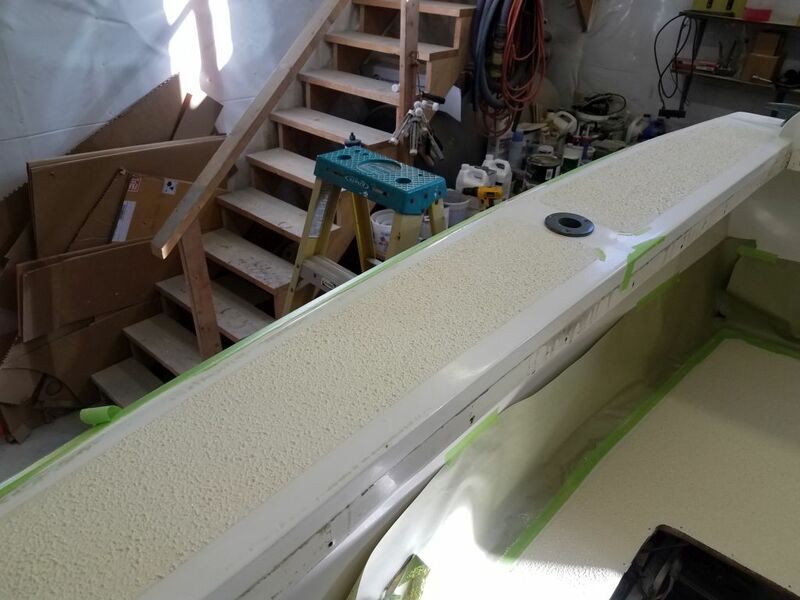 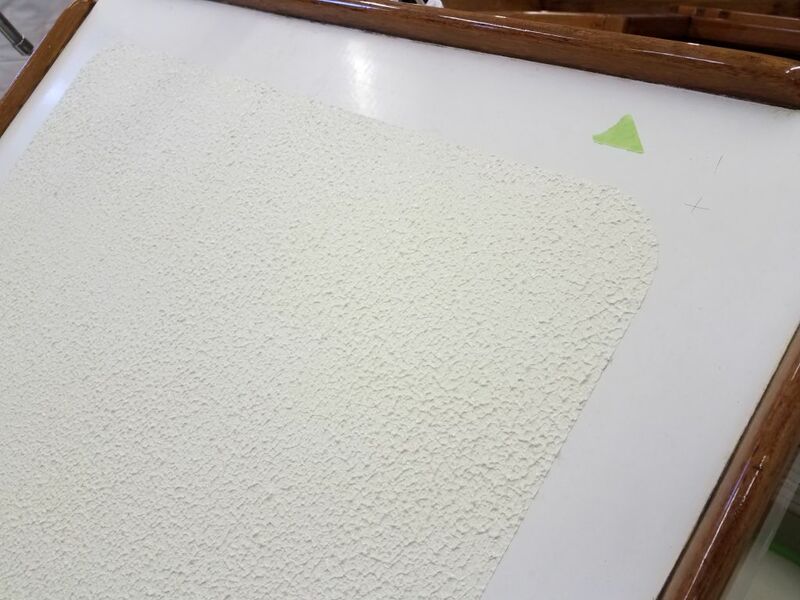 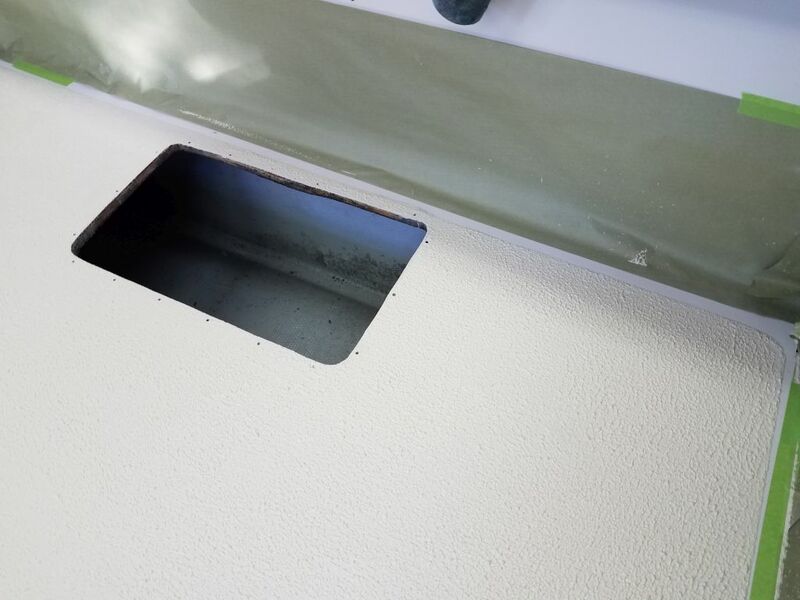 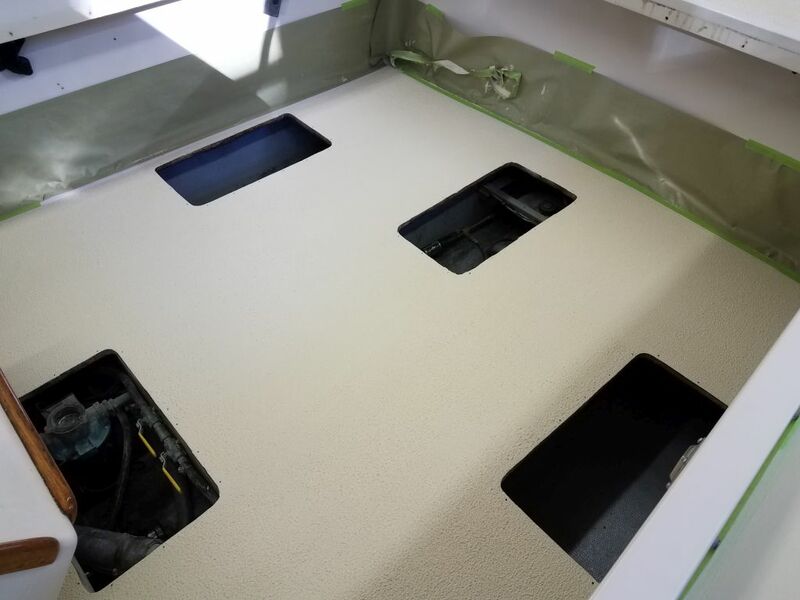 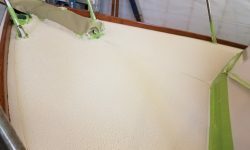 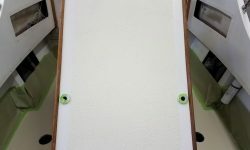 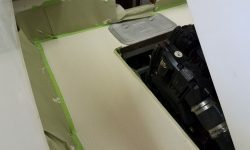 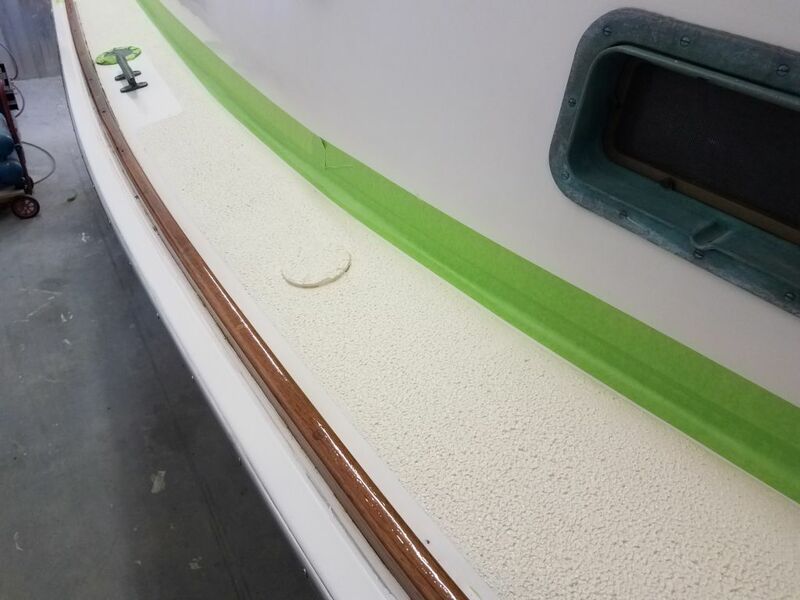 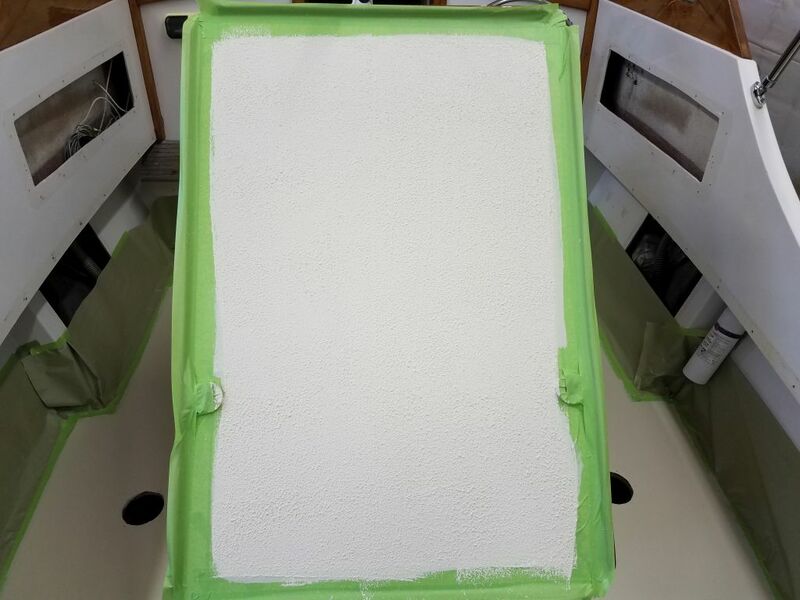 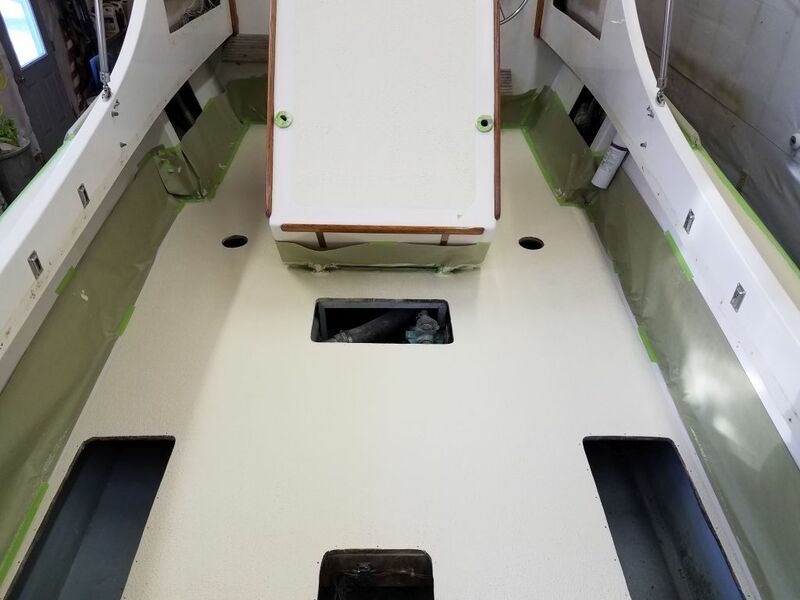 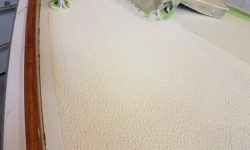 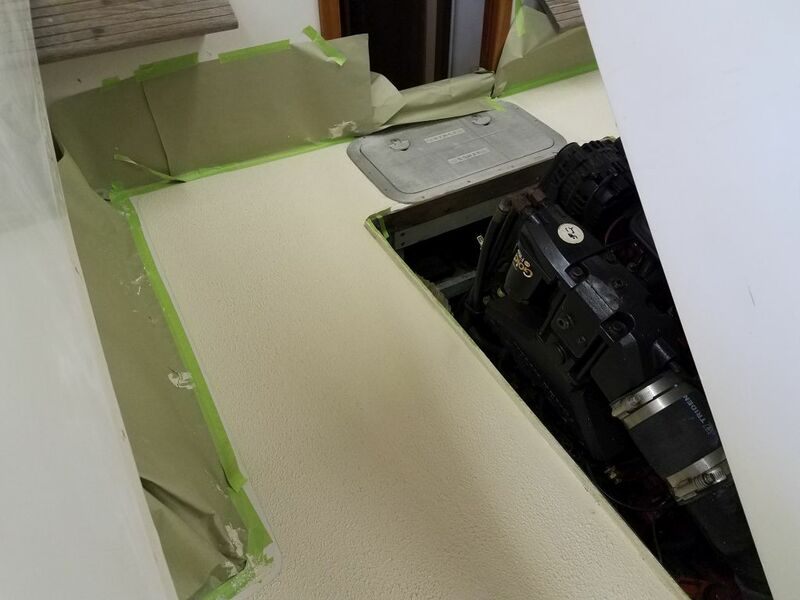 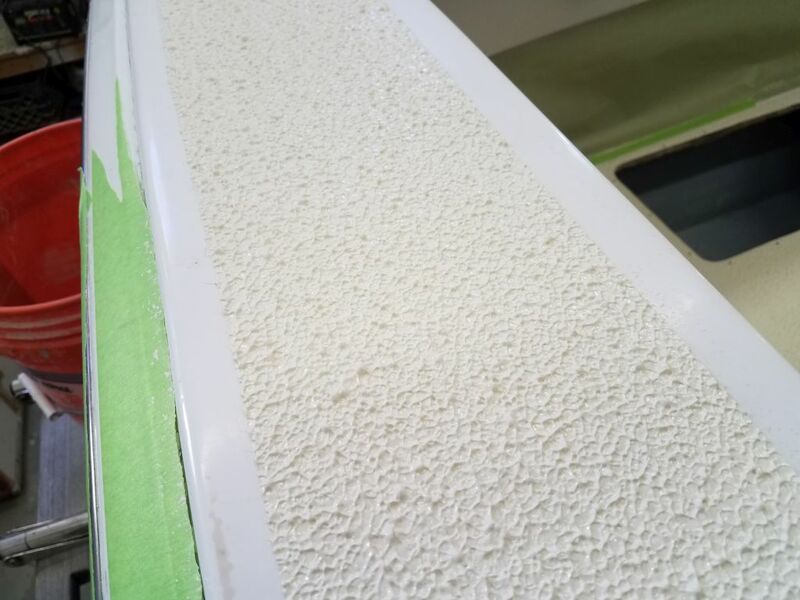 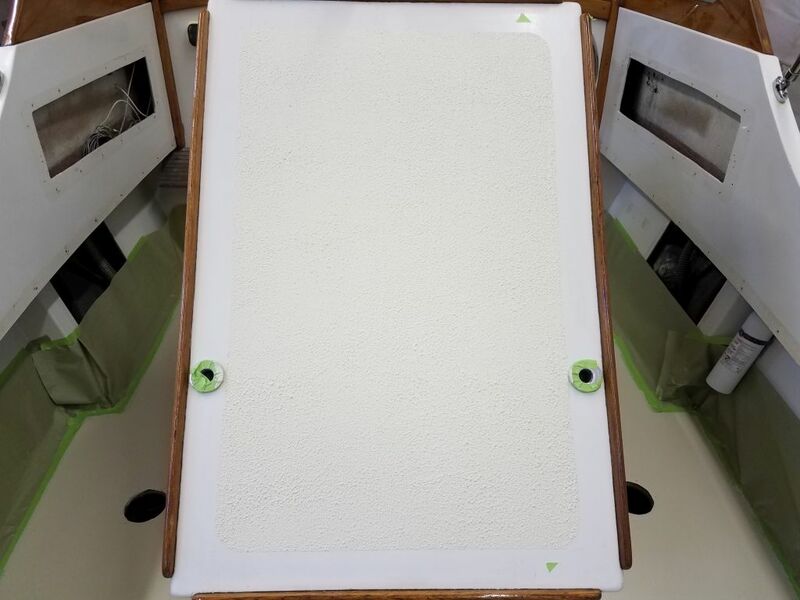 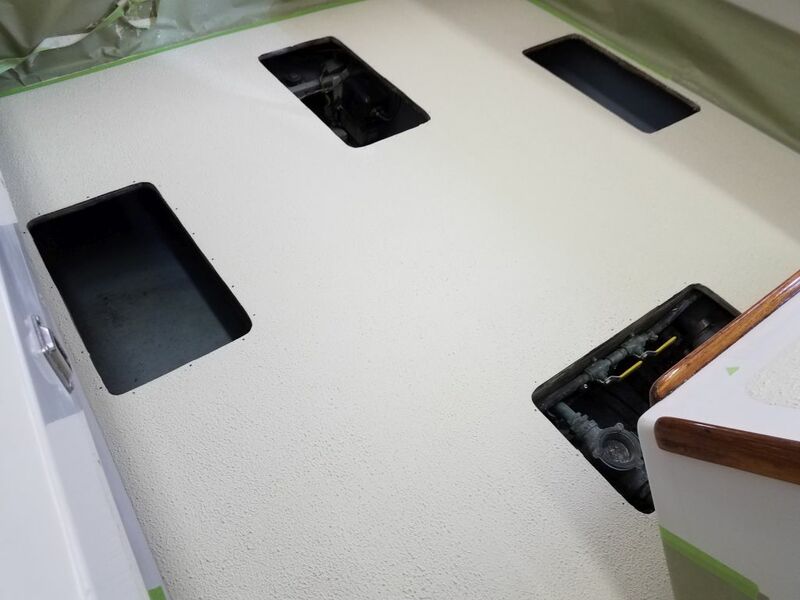 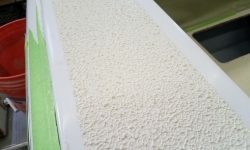 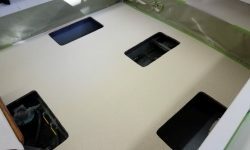 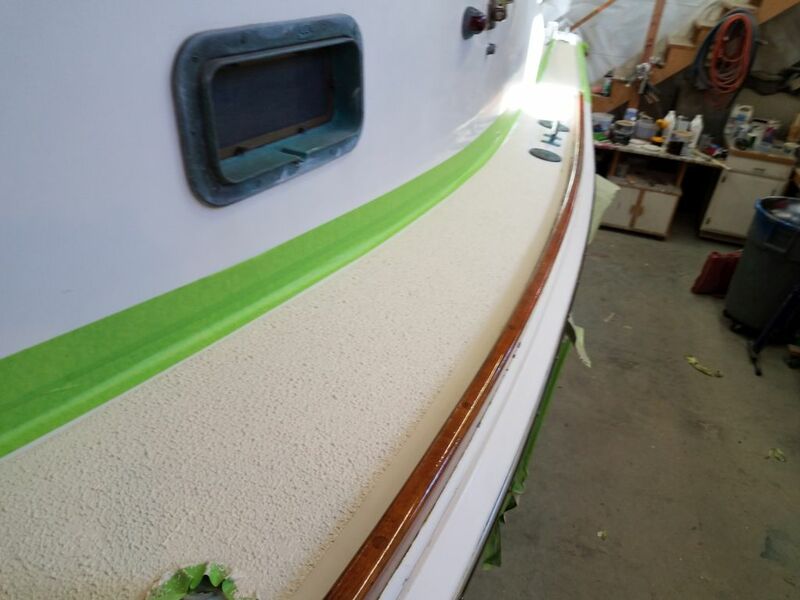 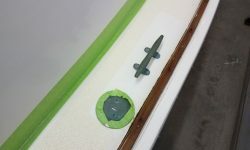 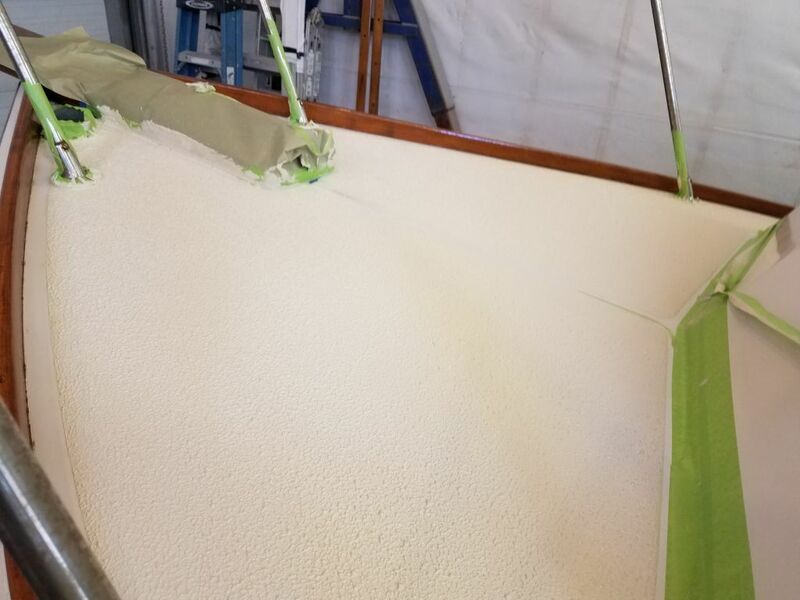 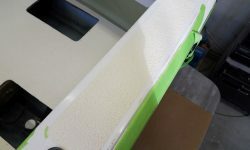 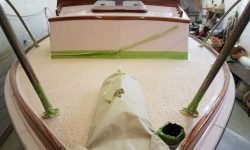 The top of the engine box, a small and separate area, served as a good test bed for the application and to fine-tune the desired texture, which is variable depending on roller pressure, amount of paint, and how much one rolls the surface for the desired appearance. 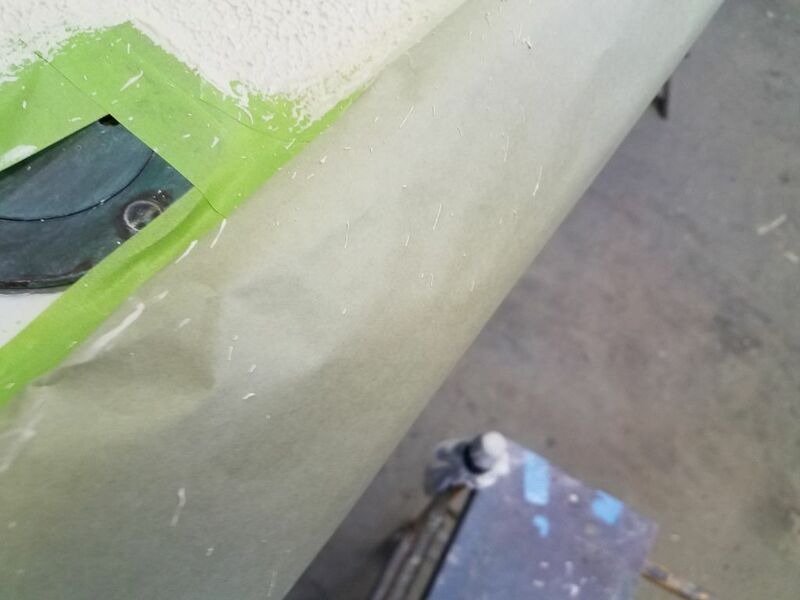 I removed the tape from this area once I’d finished rolling the paint. 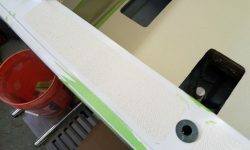 Afterwards, I continued with the rest of the cockpit, starting forward and working my way aft down both sides. 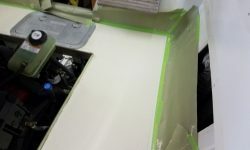 I removed the tape as I went, and was grateful for the extra masking and paper I’d installed, as it helped minimize damage from paint splatter, which was a considerable factor at all times. 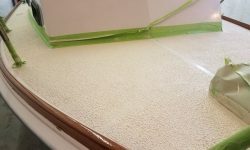 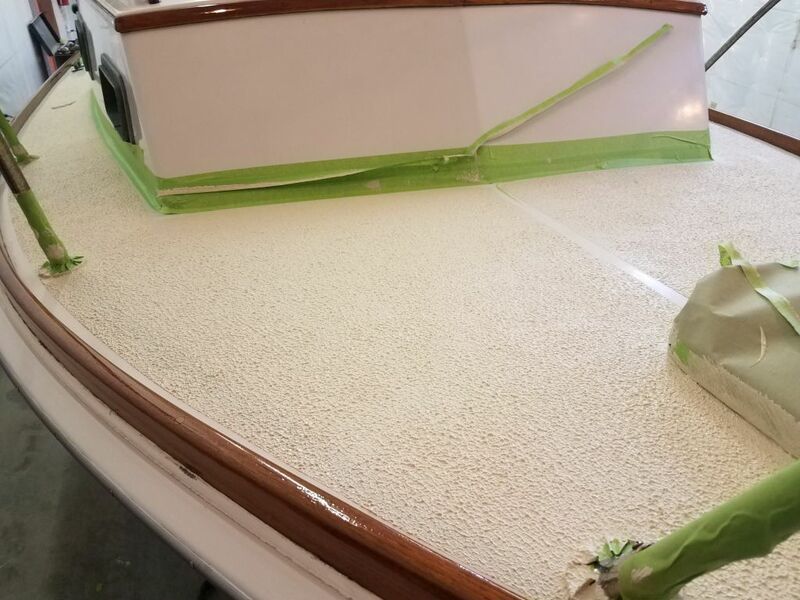 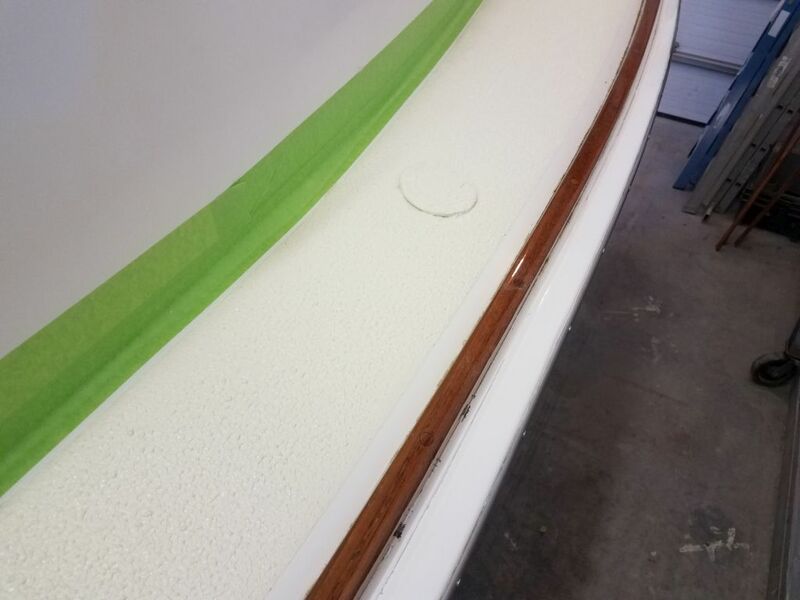 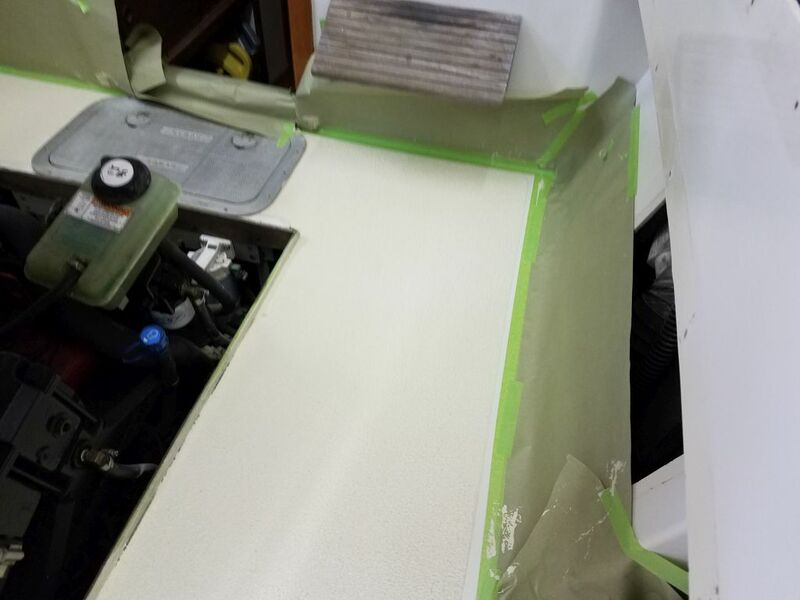 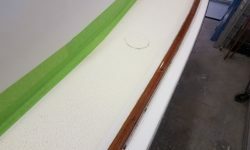 Removing the tape covered in the thick wet paint was messy, as expected, and though in some areas it also pulled off some of the tape at the bottom of the masking paper–which had not been the plan–this didn’t cause any undue issues. 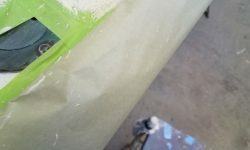 I focused only on the tape immediately bordering the paint; the remnants I could take care of later, when the paint was dry. 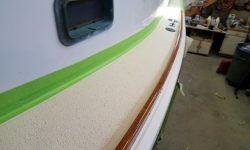 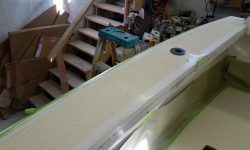 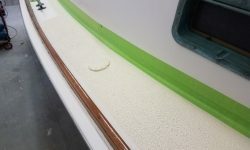 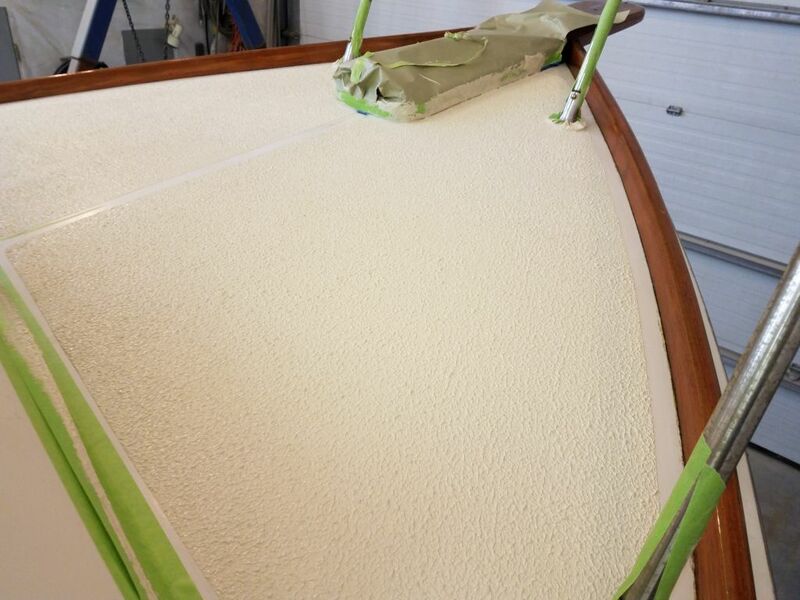 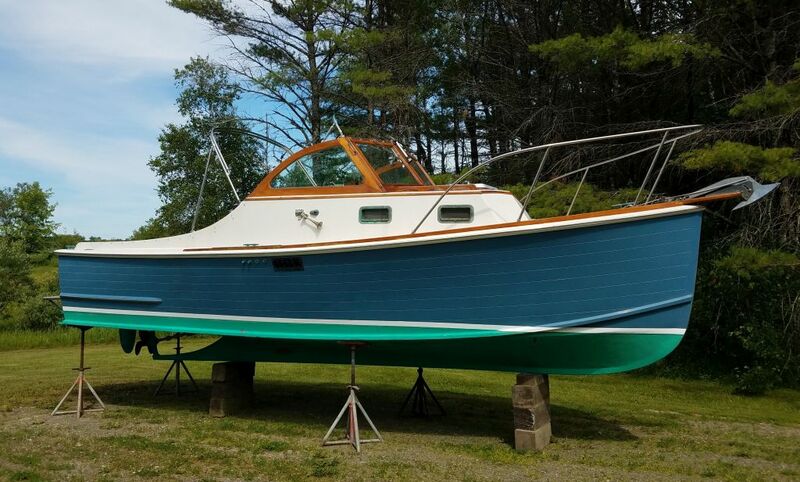 I continued the application on the sidedecks and foredeck. 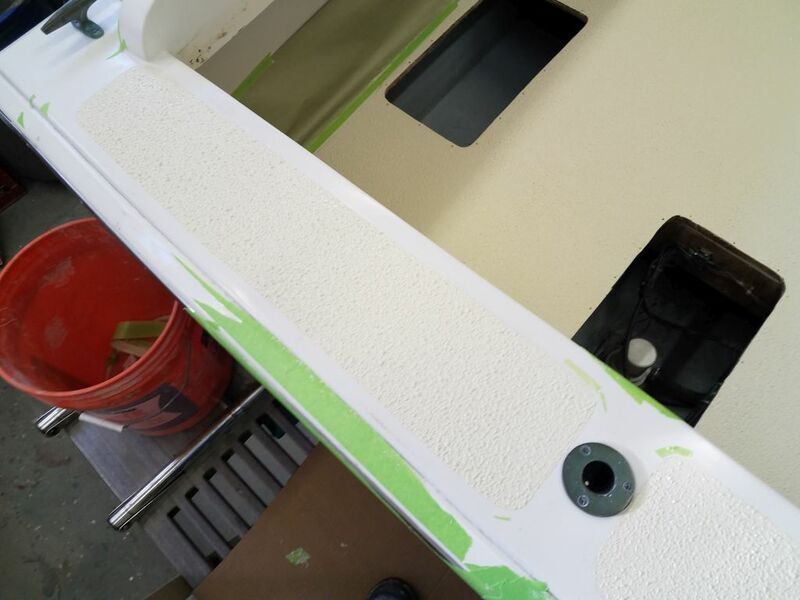 Once more, I was grateful for the additional masking area I’d set up, as there was plenty of splatter from the application, and I only wished I’d masked off the entire area around the breast cleat and tank fills, the one area where I’d not completely covered things, but I had a wet rag ready to wipe up the inevitable splatter. 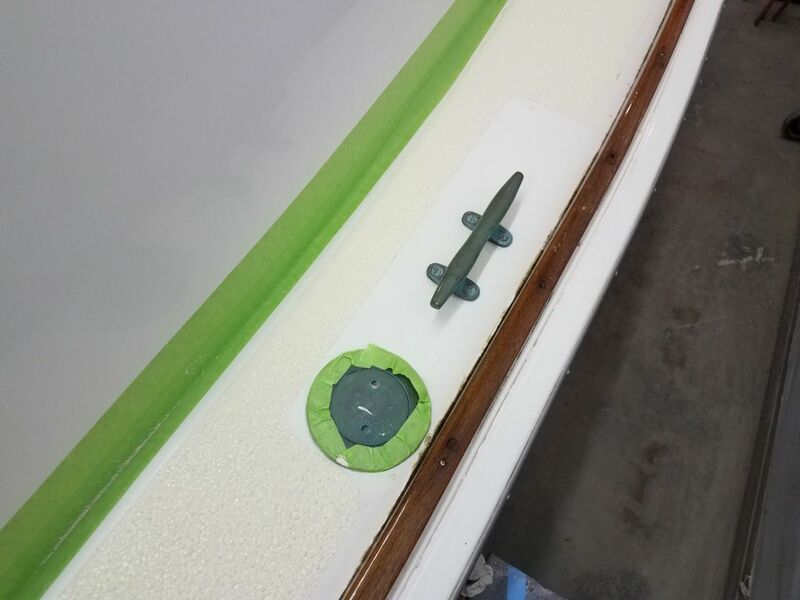 I didn’t make any attempts to remove the tape from around the hardware bases, as doing so risked too much damage to the fresh paint, so I’d have to work that off carefully once the paint dried. 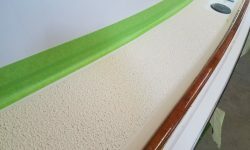 The paint color was a bit lighter than I’d expected, at least immediately following application, but I thought it would darken as the paint dried, as the dried stir sticks looked like a good match to the original color choice. 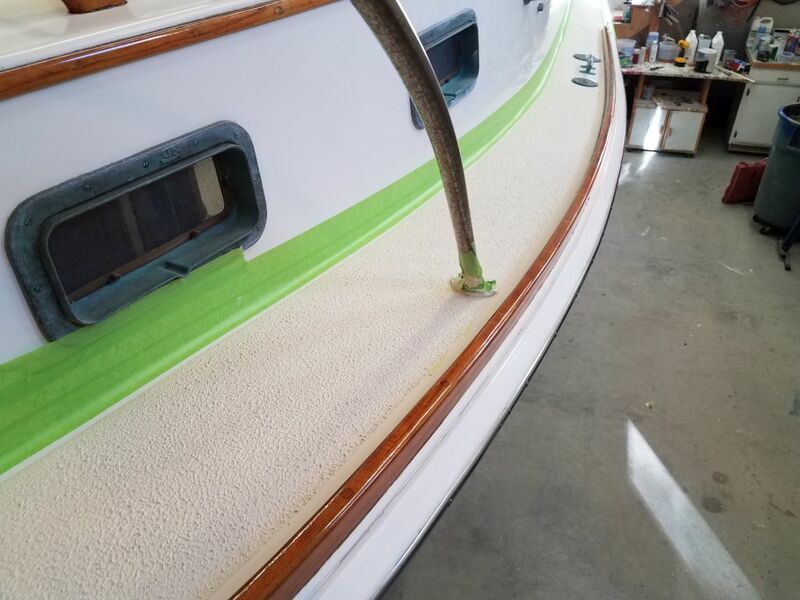 In any event, the end result looked good to me.